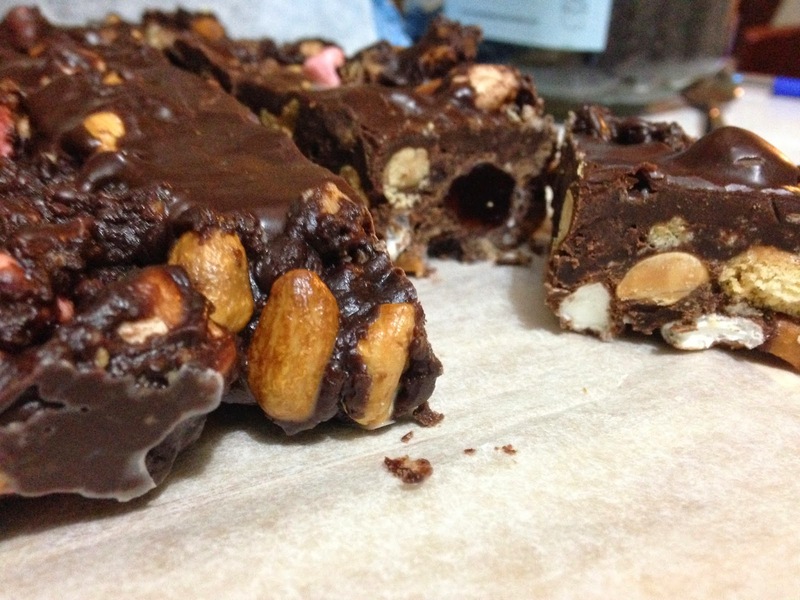 This version took me a little by surprise - it seemed to be a (slightly) healthier take on the treat masquerading as Christmas fare. While I would scoff at such a 'calorie saver' during the silly season, for the rest of the year we don't eat silly amounts of certain foods so a less calorific option is more welcome ;-) In this recipe marshmallows stay (they are fat-free after all...), and some freshly roasted peanuts were welcome, but over-sweet chewy lollies are replaced by dried cherries. 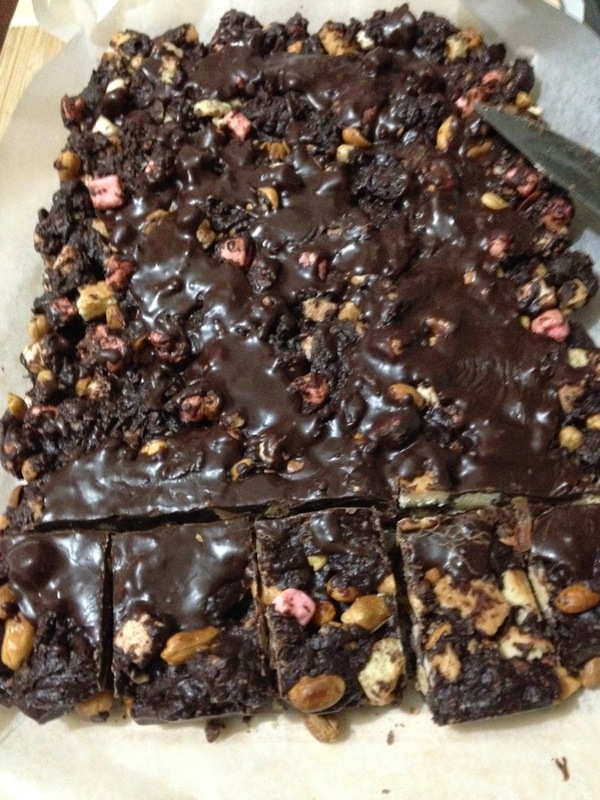 Of course, we can't do much about all the chocolate that's needed.. The original recipe is here along with a lovely picture demonstrating how you could package yours and give it away as gifts (some of mine went to the students in our home group who were studying hard for exams). 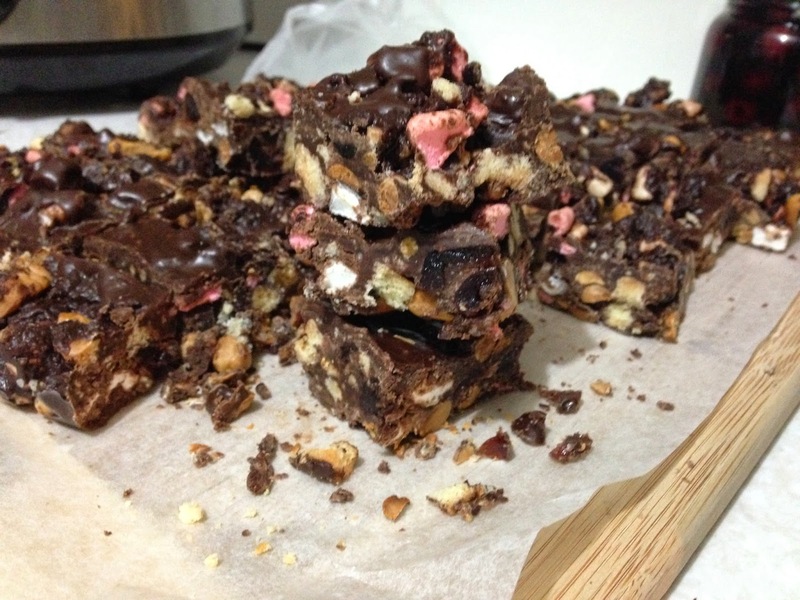 I found that there was definitely not enough chocolate compared to the other ingredients, and I 'finished packets' of some things, so ultimately I probably increased the recipe by about a third. But who's going to complain for more and thicker slices of this treat?!?! Line a 20cm x 30cm pan or dish with baking paper. Place the chocolate in a bain-marie (small metal bowl above, but not touching, a saucepan filled with a small amount of simmering water). 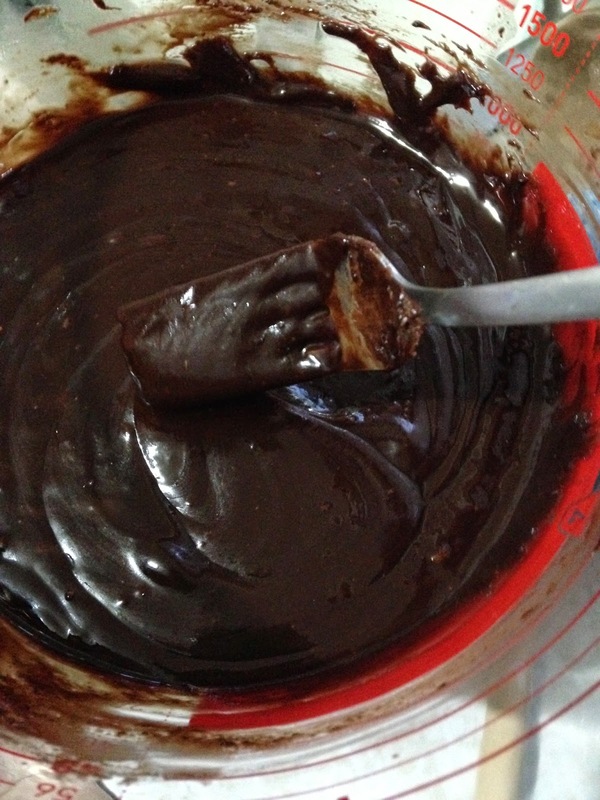 Stir the chocolate with a fork until melted and smooth. If you have raw nuts, roast them for 15 minutes in the oven at 180 degrees Celsius in single layer spread over the base of a roasting dish, stirring occasionally; cool for half an hour before using. If you are using brazil nuts, roughly chop them before placing in a large bowl. Halve the cherries (if whole) and add to the nuts. 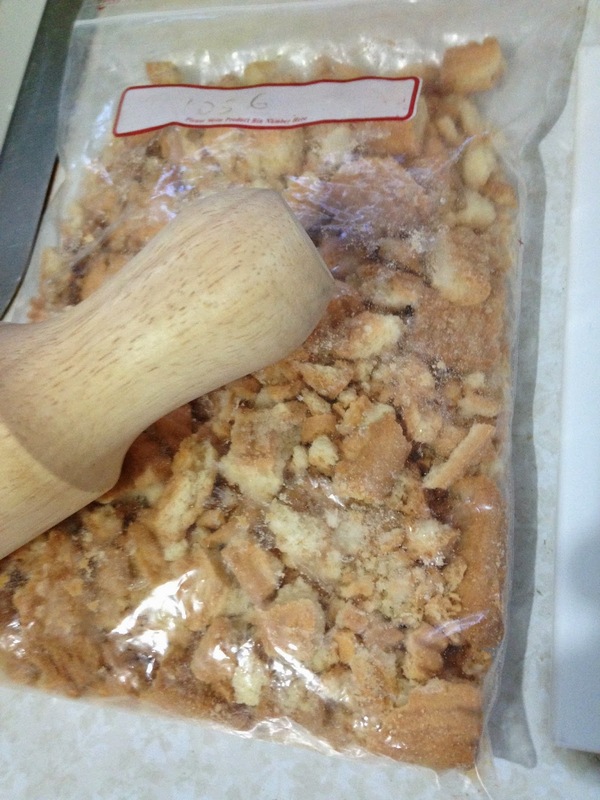 Give the shortbread biscuits a few hits with the rolling pin so they break into pieces about the size of your thumbnail (leave them in their packet or place them in a plastic zip-lock bag first). 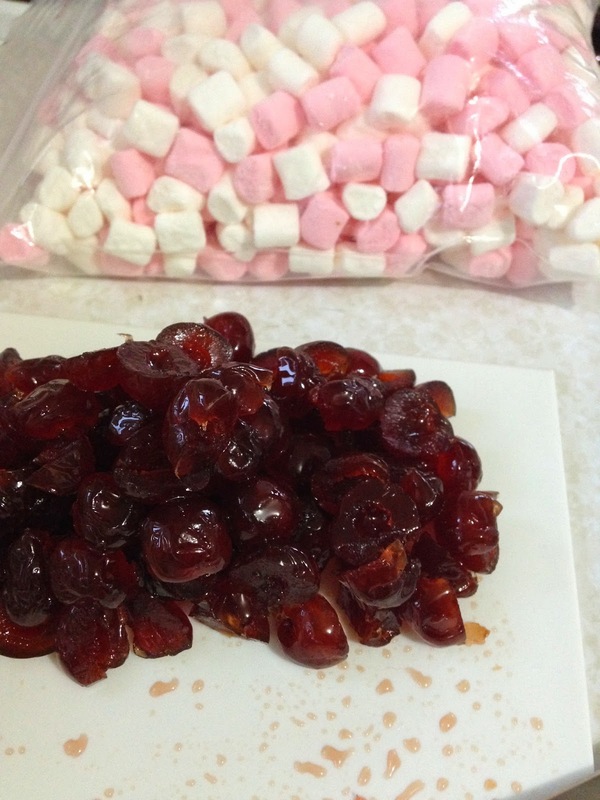 Stir the biscuit pieces and mini marshmallows in with the nuts and cherries. 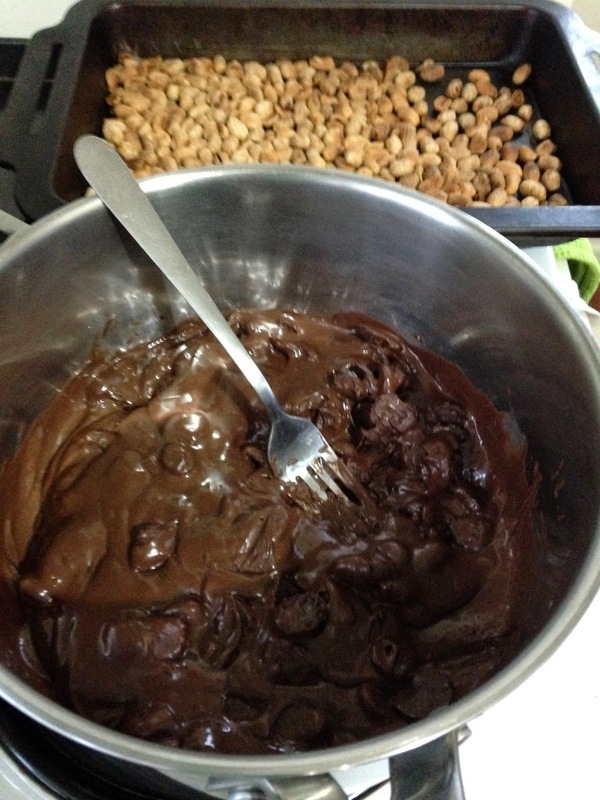 Pour the melted chocolate into the bowl of ingredients. Stir gently until everything is well coated in chocolate. 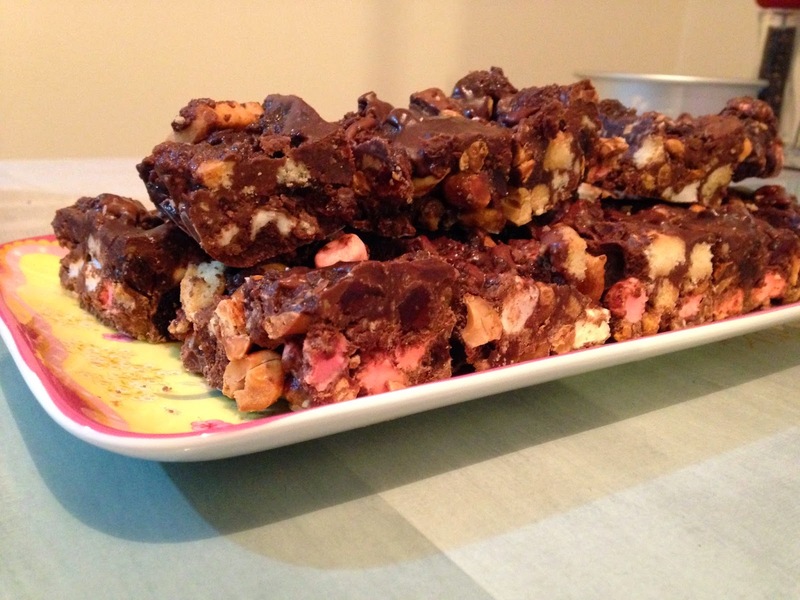 Pour the rocky road mixture into the prepared pan and smooth down with the spatula. Refrigerate until set (between half an hour to an hour, depending on how much of a hurry you're in to try it! 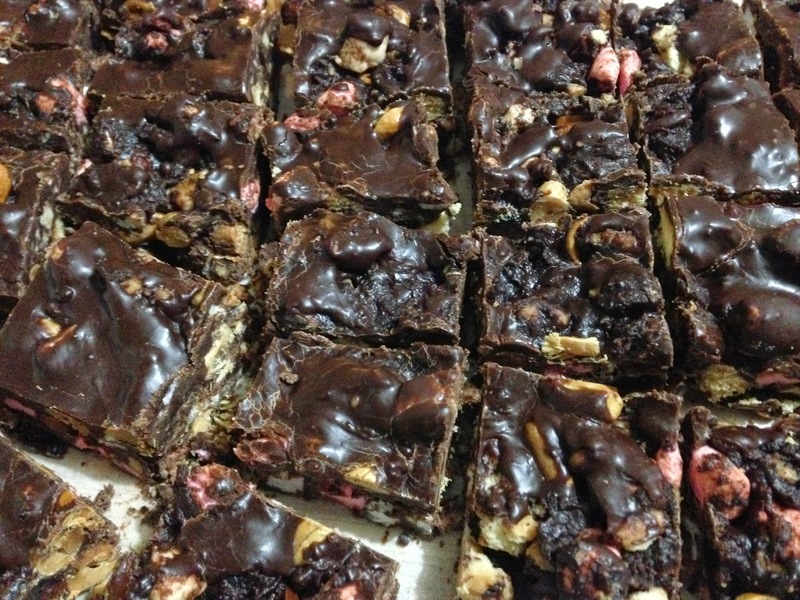 ), then cut into small squares to serve. This recipe makes 30 to 40 pieces, depending on how generous you are with your servings! Happy mid-winter Christmas, perhaps!? !